VisaMon 170RD-HP is a small speaker that employs a woofer Visaton AL170 and a tweeter Scan-Speak R2604-833000. VisaMon 170RD-HP has been developed by Bernd Timmermanns. The crossover consists of a 2nd order high-pass filter (12 dB per octave slope) for the tweeter. The woofer is connected to a 2nd order high and low-pass filter (12 dB per octave slope) with a parallel RCL to smoothen the frequency response. 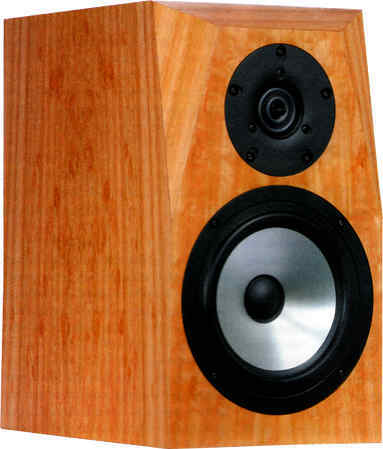 Between 200 Hz and 40 kHz, the frequency response of this loudspeaker is linear on axis. The decay spectrum is perfect. At low volume, i.e. 90 dB at 1 m, the nonlinear distortions are below 0.8% above 200 Hz. We deliver Visamon with different cut-off frequencies to adopt it to a subwoofer. If you don't want to use a subwoofer, we recommend the the DIY kit Visamon 170. The high-end kit comes with Mundorf EVO silver gold oil capacitors for the tweeter. The coil for the woofer is a CFC 14 foil coil. All other inductances are baked varnished coils. Both coils for minimizing microphonic effects. - The current flow through the coil creates a magnetic field which sets the reel of wire in motion. This motion induces a voltage in the coil which adds itself to the signal. The stiffer the reel of wire is, the less the signal will be altered.